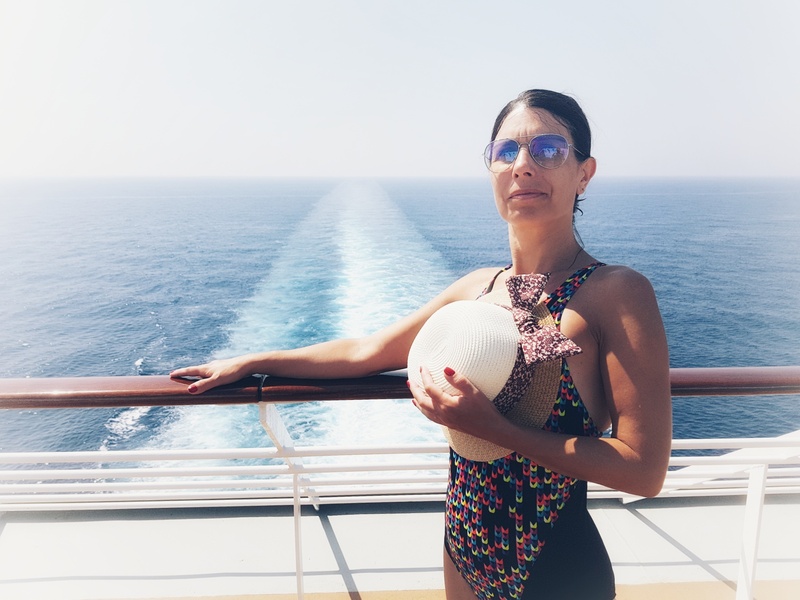 There’s no better day to write about the life onboard than a day, during which you’re spending all your time on the ship. Yesterday we were sailing from Ibiza to Olbia. Our time in Spain is over and we’re back to Italy. We left the dock approximately 6am today, and we’ll arrive in Olbia tomorrow morning, around 7am next day. There’ll be plenty of things to do today, and there’s always reading and sleeping as well. This trip we’re on a quite small ship. MSC Opera has only 9 decks (floors), which are available to passengers. Five of those contain public facilities, the rest are the passenter’s cabins. 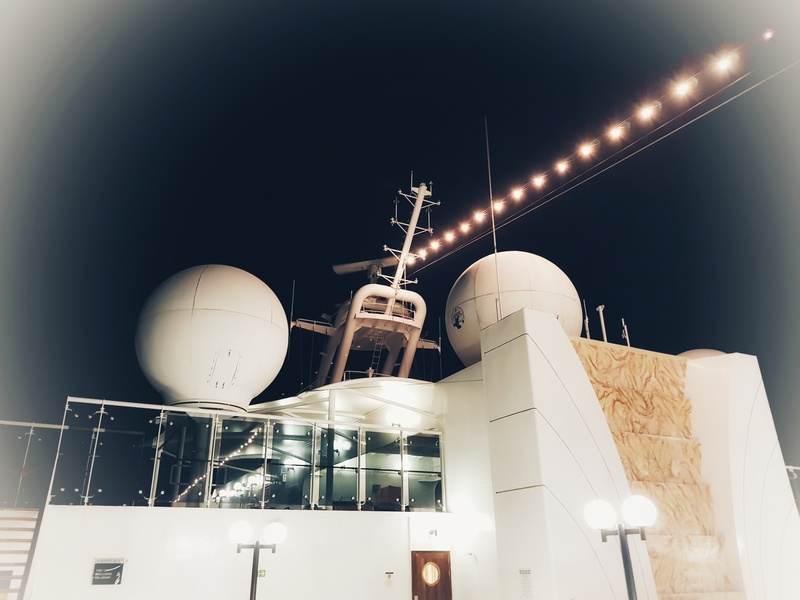 Our cabin is on deck 9, which gives us excellent access to the “fun” decks, situated on the top of the ship. 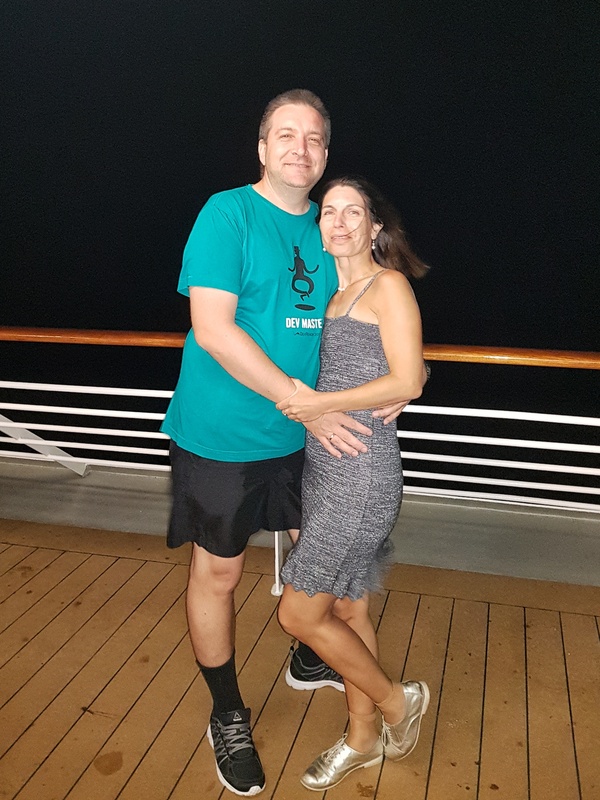 While on the ship, we spend most of our time on decks 11 and 12. There we have the swimming pools, the restaurants and the buffee and bars, where any passenger could get food and drink almost 24×7. The pool area on decks 11, 12 and 13 has a good number of sunbeds around the pools and the top terraces above them. No matter this, it feels rather crowded at these levels, when the ship sails and the weather is good. As one could imagine, I’m staying as far as possible from these places, because they represent the two things I dislike: crowds and splashing (salty) water. One exception though: I spent almost 1h on this day, doing 55′ powerwalk exercise, as there was no other way to walk during this day, and I was repelled by the crowds in the fitness. For people like me, there are plenty of places to sit on levels 11 and 12, which are just before or after the pool area. There I can put my PC, my e-stuff and drinks, and enjoy some quality time. The restaurant at the back of the ship provides a great view of the sea, combined with air conditioning and power socket, so it’s one of the good places for me. Another good place for me would be practically any area on decks 5 and 6, except the library, where one very stupid mind decided, that it would be a great idea to add a bar for smokers just next to it. In this case, if someone would like to go to the library, it would require passing through the most disgusting place in MSC Opera. 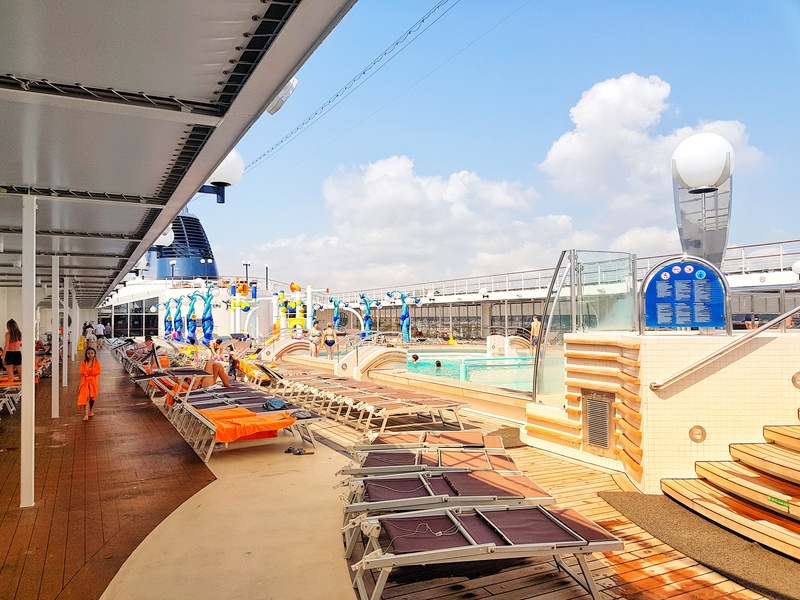 Deck 12 itself consists of an open terrace around deck 11, and some specialized facilities: the disco, two juniors’ clubs, and the shuffleboard. All this at the back side of the ship. Floor 12 front side is the VIP area for the passengers, willing to spend the big bucks for a trip. Can’t say much about it, because it’s forbidden for us, the cheap villagers :). We know it exists because we can see it on the map, together with an “exclusive solarium” on the top of it. Maybe one day I wouldn’t care so much for the other expenses and I’d be willing to spend the amount, required to get access there? Until then, my inside cabin is just “good enough”. 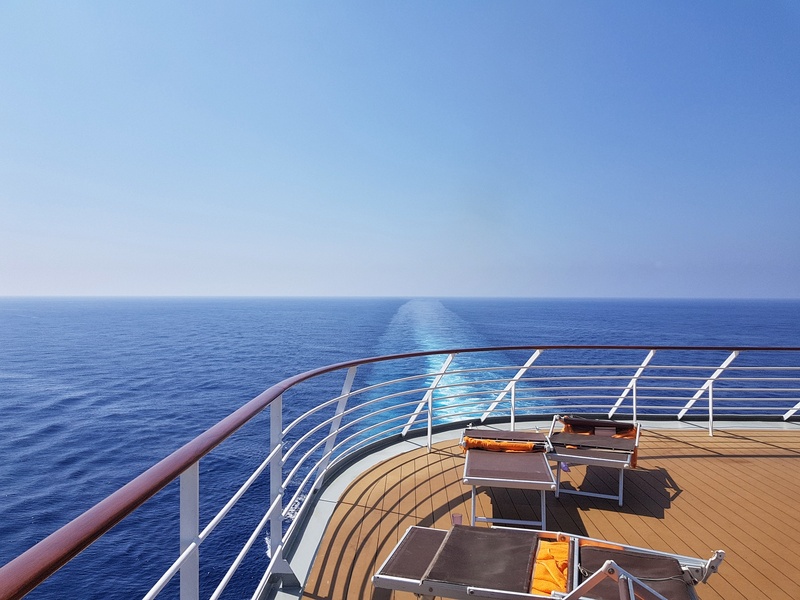 Frankly saying, I was more than open to getting a cabin with a terrace or at least a window, but due to the size of the ship and our too late booking, there were none available for us on a logical price, when we decided to book. The inside public decks are 5 and 6. 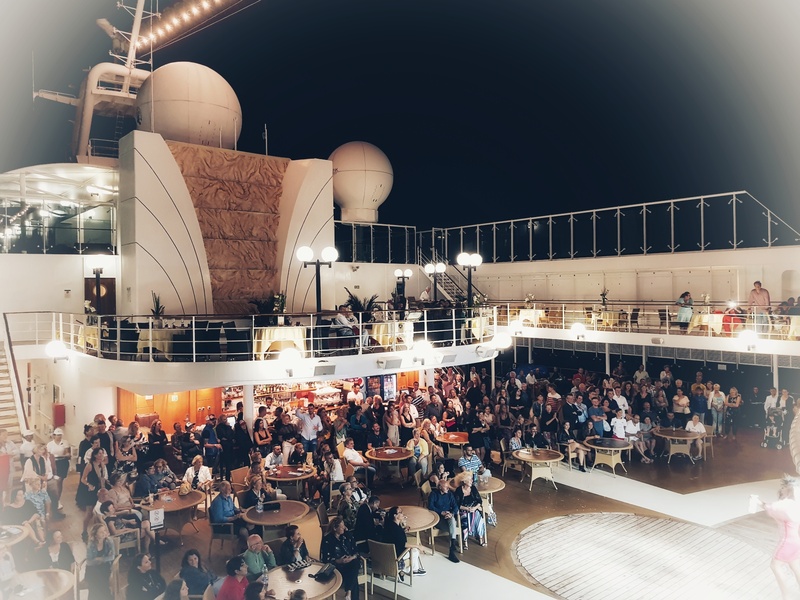 In the front of the ship, both decks join into “Teatro del Opera”: approximately 1500 seats’ theater, where the entertainment part of the cruise happens. Deck 5 has also our restaurant (“La Caravella”), some administrative desks such as reception and excursion office, and if course few bars. 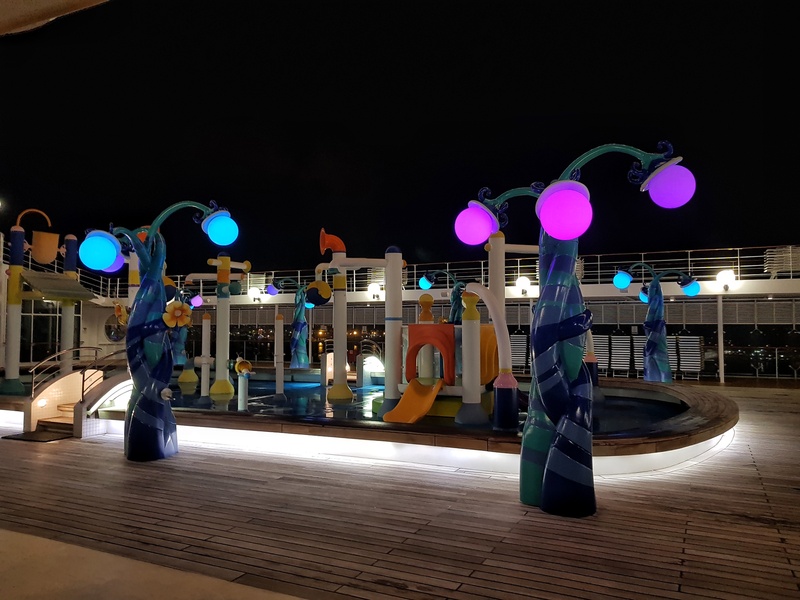 Usually, deck 5 and 6 are the places to walk after dinner, so one could browse the shops, pick a bar with entertainment, or browse through the pictures, which they do for us from time to time. During the day one also could sit there and finish a blog post about the ship :). 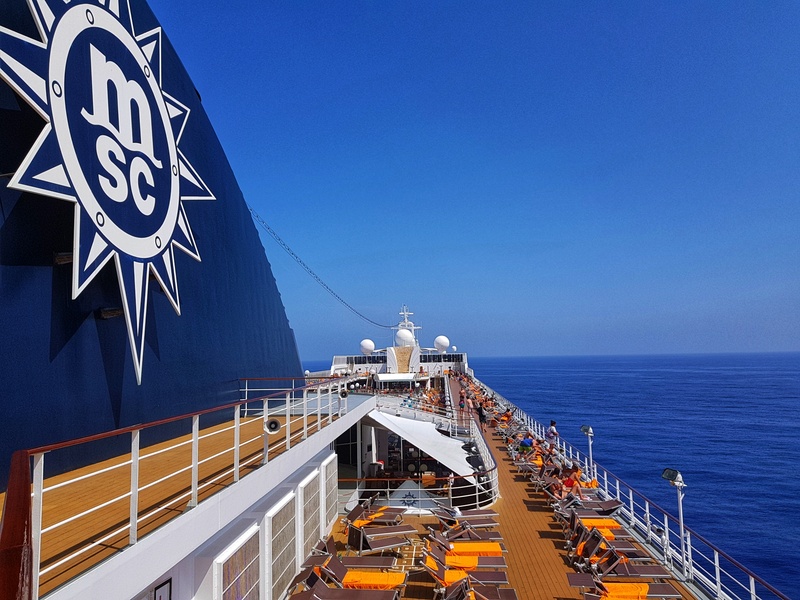 Speaking about photoes, MSC Opera is much more relaxed from this perspective. On MSC Fantasia we felt almost annoyed because there was a photographer on almost any public event. It did not feel good, especially when you know they’ll screw up the post-processing, and make you look like a glass doll (why? why they always do this?). And then they’ll ask for €10 per picture. I wonder how many people are willing to purchase this service, but its existence shows there are enough to make it overall profitable business onboard. Profitable, but annoying :). The theater performance onboard is great, so far. This ship’s troop throws good shows, compared to the others we know. Our last cruise had much bigger theater and troop, but they were not doing that much, speaking of performing from within your heart. So far, I liked all what I saw. I was very impressed by the Flamenco show, which two dancer’s couples from the theater troop threw one evening. Initially I thought they were a visiting troop (we were staying that night in Ibiza), but I saw them later in the other shows as well, so obviously, the Flamenco was their main expertise (at least for two of them). 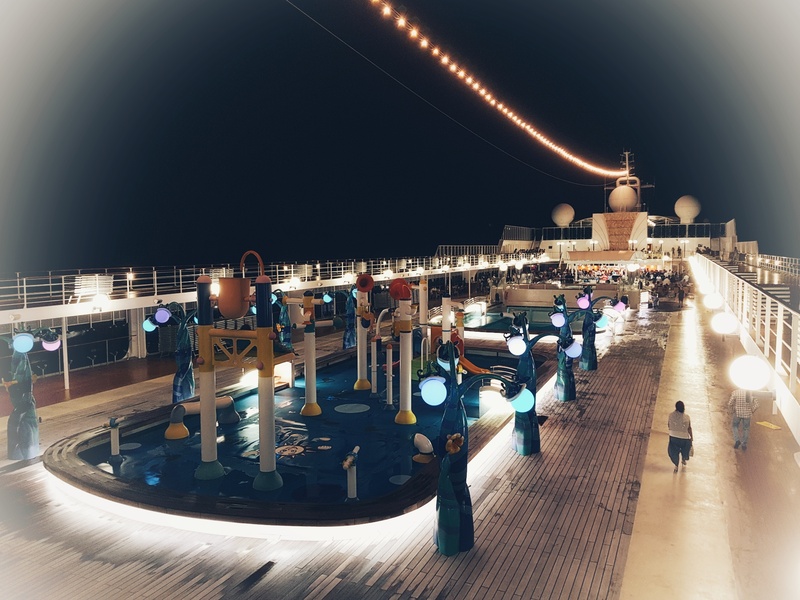 The gala night happens once during the whole cruise. Usually, this is the night, when the ship sales during the whole day. It’s accompanied by the best show (“Dirty Dancing” themed, on our cruise), and by few selected cocktails with private invitations: in our case the cocktail for returning guests, which we got an invitation for, and a cocktail we saw on deck 12, which looked like a private wedding party. During the “Welcome Back” cocktail we had the chance to speak with the person, which is responsible for the future MSC Cruises. There’s a good chance to get a nice discount if you book your next cruise while cruising on this one. Let’s see if he’ll get us a good deal for next year. In general, that’s it. I’ve collected few pictures, which you might find interesting. If you’ve got any questions, use the Comments’ box below. 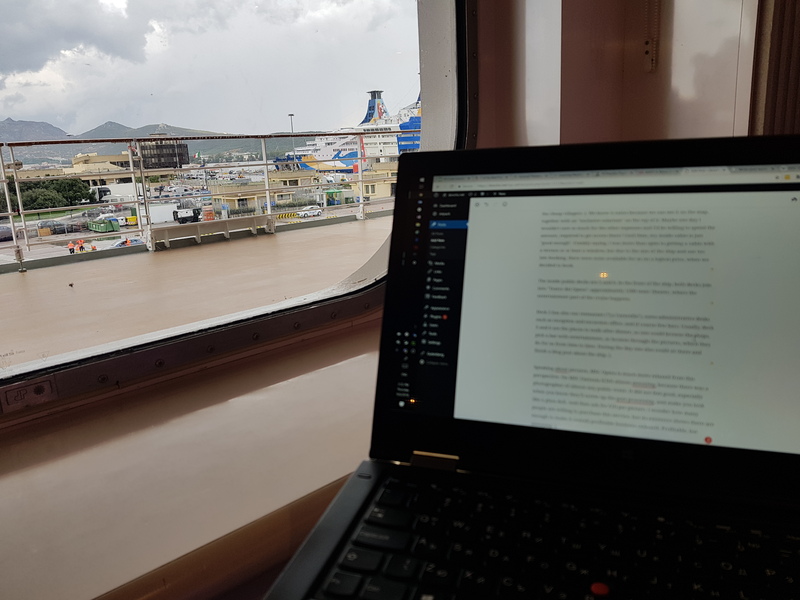 Finishing this blog post, while getting good 4G signal from the nearby port. This is part of the daily newsletter, which any cabin gets delivered. 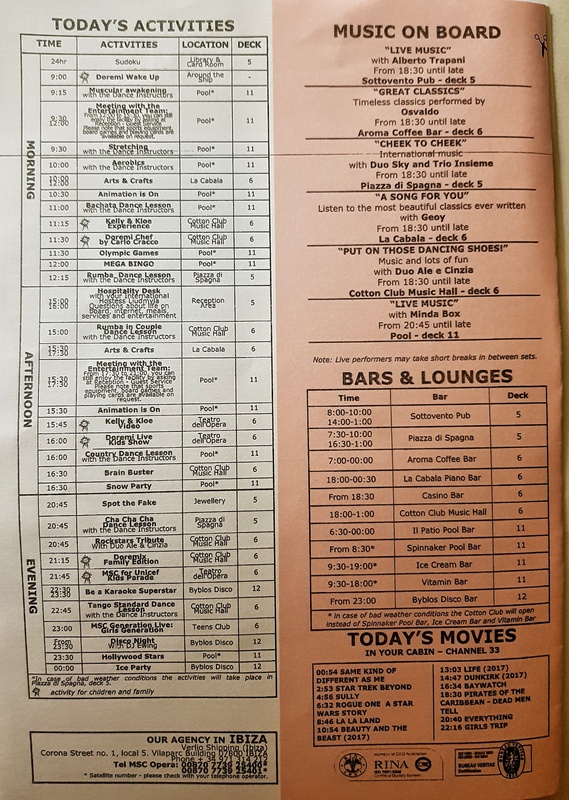 This sheet contains all daily entertainment. 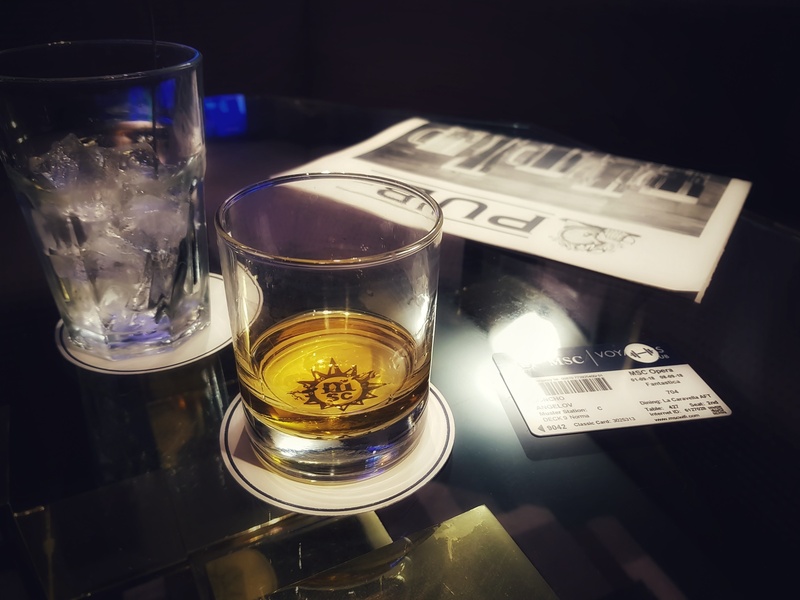 I found a great single malt, smoked whiskey last evening. “Bowmore”, 10 years old, might become another of my favorites at home. The pool area at night. This is the quiet side of it. The party happens approx. 150 m further. Sunbed area on the terrace at level 12. I’m shooting this photo from deck 13, the highest on this ship. Deck 13, rear side. The ship’s trail is impressive. An adult couple, after nice dinner. Vesi is accompanying me after the dinner, while I wanted to do few last hundred steps (explains her dress and my t-shirt). Young female posing infront of the ship’s trail. The pool area at night. You can see the party in the very far end of it. Part of the party crowd. Above, the empty tables are supposed to be for the private dinner (or wedding?). Ship’s front, pictured from the back. The rotating radar, right above the Bridge. This entry was posted in Daily, Български and tagged круиз 2018 by Doncho. Bookmark the permalink.